There are few things as welcoming and cozy as the smell of a campfire and the taste of toasted marshmallows coming from your backyard, whether they are at the end of a stick or nestled between chocolate and graham crackers! Don’t have a backyard fire pit? Here we’ve outlined exactly what you need to do to build your own, making for the perfect weekend DIY project. 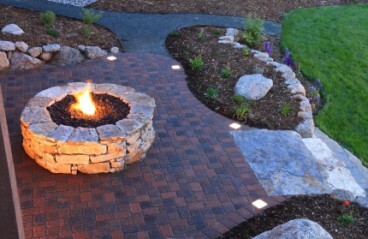 This fire pit will cost you approximately $100-250, but doesn’t require nearly as many materials as other DIY fire pits. The first thing you’ll want to do is collect all of the materials and tools you will need to get the project started. Now that you’ve chosen the color stones and have a safe spot picked out, you’re ready to get this project started! First decide on the size of the fire pit you want to have and outline a circle. Dig out a hole roughly 1″ below ground level, add 2″ to 3″ of your small pebbles, then use the hand tamper to lightly compact the stone into the ground. Lay your paving stones in a circle around the opening. The number of rows you’ll need depends on the size of the pavers you’ve chosen, but usually 3 or 4 rows will hold about 3 to 4 medium size logs for burning. As you add layers of stone on top of one another, stagger the pattern so the breaks overlap. This will help with stability and add to the visual appeal of the finished fire pit. Step 4: Add logs and ENJOY! At this point, you’ll want to put a few logs in the fire pit, add some kindling, and start your fire. Have the marshmallows ready because the campfire smell will be all the invitation you need to get friends and family wandering into your backyard! The instructions for this DIY project originated from diynetwork.com.